One of the more endearing aspects of The Flash is the way that it embraces the stock superhero clichés. It is a television show that seems completely unashamed of its genre trappings, occasionally basking in its cheesiness. The dialogue is occasionally corny, the set-ups occasionally forced, the plot beats a little melodramatic – but that is a large part of the appeal. The Flash feels like something of a live action comic book. Going Rogue is an episode that basks in its pulpy four-colour roots. Not only does the episode find a bright design for Leonard Snart that hues close to the character’s roots, not only does the show bask in various “cold” puns, not only does it lean heavily on the “save the innocent or catch the guilty” moral dilemma, it even throws in a nice crossover love triangle to keep things interesting. Going Rogue is silly and goofy, but in all the right ways. Endearing and charming, it is a demonstration of how well the show can work. Appropriately enough for a television show based around the fastest man alive, City of Heroes moves pretty damn quickly. The forty-five minute episode tears through all the requisite superhero origin elements in forty-five minutes. It takes us two minutes to brush through the story of Barry Allen’s childhood trauma. By the ten-minute mark, Barry has already been hit by lightning. At the end of the forty-five minutes, his uniform is complete and his ensemble fully formed. There are some minor problems with The Flash, but City of Heroes offers a pretty solid start for the series – hinting that perhaps the show has already found its legs. This should be the defining Justice League book of the 21st century. Geoff Johns is something of a DC comics super star, a writer who has worked on all manner of major and minor DC characters, and helped shaped the fictional universe for the better part of a decade. 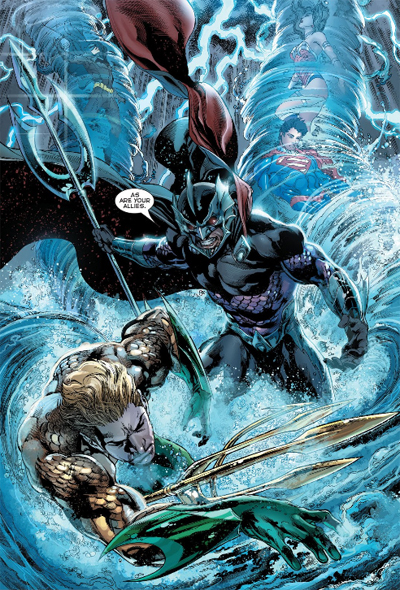 Jim Lee defined the look of DC comics, particularly with the revamped “new 52” character designs. He’s a super star artist who produces iconic superhero images. So pairing the two up on DC’s flagship book, relaunched as part of a line-wide initiative, should be something to watch. If Johns can turn Green Lantern into one of DC’s biggest franchises, imagine what he could do here. However, their first six-issue arc, Origin, seemed troubled. It was a decently entertaining big-budget blockbuster of a comic book arc, but it didn’t really provide a clear vision of these characters and their world. New Frontier, for example, remains a more thoughtful and introspective origin story for the team of DC’s most iconic heroes. The Villain’s Journey improves a great deal on Origin, but it’s still deeply flawed, with a sense that Johns and Lee are struggling under the weight of having to make these characters “relevant” to the modern world. There are moments of brilliance in Man of Steel. I like the golden-hued Malick-esque glimpses of Middle America, evoking the work of Norman Rockwell. (Indeed, the earliest glimpse of Clark Kent’s life on Earth seems to evoke Teacher’s Birthday.) I like the decision to cast Jor-El as a pulpy science hero rather than a stand-in for God. I like the way that the movie embraces the concept of exceptionalism, and doesn’t shy away from the American ideals embodied in Superman’s mythology. I appreciate the development of the Kents into more than generic slices of apple pie. 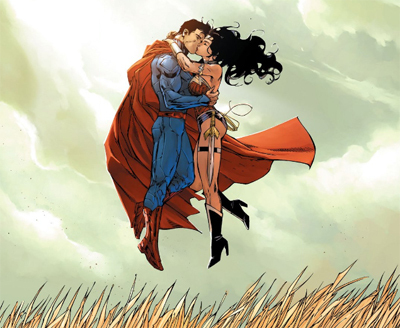 However, for all of these lovely moments, there’s a sense that Man of Steel resents the fact that it is a superhero origin film. It’s easy to understand why. Superman origins are a dime a dozen, and it’s hard to imagine anybody could be unfamiliar with the broad strokes of the story. However, Man of Steel does find an interesting and nuanced angle on that first crucial Superman story… only to become something radically different. A little under half-way through, the film morphs into a big budget superhero spectacle, sandwiched between the outline of an origin story and chunks peppered throughout like some form of tossed salad. Man of Steel suffers because it’s a lot less interesting than it might have been, and it revels in that comfortable blockbuster mediocrity.